Guys, if you've been following this blog for a while, you might have heard me mention my anglophilic tendencies. I'm immensely fascinated by all the historical figures of English royalty and the wars and basically just EVERYTHING. I also happen to have a love for Philippa Gregory's writing, because usually she writes about English historical figures in a way that makes me feel ALL THE THINGS. I really loved the third book in the series, The Lady of the Rivers, so of course I jumped at the chance to read The Kingmaker's Daughter! Ever since I learned after reading the Lady of the Rivers that Elizabeth Woodville was the mother of the princes in the Tower (the mystery of which I find endlessly sad and fascinating), I've been dying to know more about her. And this novel showed me a whole different side of things than what I came to know in The Lady of the Rivers! I love that Philippa Gregory manages to make me LOVE characters in one novel and then really dislike them in another because they're from a different view point! 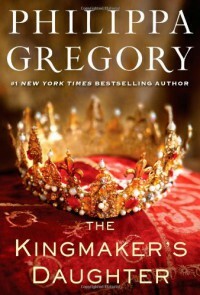 If I'd investigated more before going in, I would have probably already learned what happened to one of the characters I'd come to love so much in The Lady of the Rivers, Elizabeth Woodville's father, but I didn't and when it happened in The Kingmaker's Daughter I was so incredibly sad and heartbroken! I liked Anne, though she was not a very strong girl/woman in my opinion. She's constantly being led around by men and doesn't seem to have strong beliefs herself for a large part of the novel. I never really connected to her or to Richard III, who I really got to be annoyed with toward the end of the novel. All the implied plots and mentioning of poison and witchcraft makes me wonder what exactly was true of all this, the novel doesn't give a definite answer and I kinda like that. There was a lot of repitition in the novel and one particular event that also contained a dying horse is played again and agin. I sort of get it, but it was hard for me to read this, cause I HATE when animals die.